Router articles: What is a Dual Band Router? Do you find your router is as slow as a turtle? Do your videos continue to buffer forever? Connectivity issues troubling your Internet use? Well, it definitely means you need to switch to a dual band router from a single band router. Wondering what is a dual band router. Let’s find out from the following paragraphs. A dual-band router are wireless routers that has the capability to transmit on the 5 GHz and 2.4 GHz wireless band. A single band on the other hand can pick up signals only from the 2.4 GHz band. Why Need a Dual Band Router? The single band router has only 3 non-overlapping transmission channels. This makes it easy to be vulnerable to interference from home appliances such as microwave ovens or even your smartphones or Bluetooth devices, televisions as well as cameras and Wi-Fi hotspots. Thus, making the single band slow and cluttered. This causes you to end up with a slow connection. Dual-band routers are a better choice today as they can solve most of your connection and speed issues. Today dual band routers have advanced to Wireless-AC dual band devices from the Wireless-N and Wireless-G devices. Dual band router has many advantages over a single band router. A wireless dual band router can pick up both 2.4 GH and 5GHz bands. In today’s world, one does not just use the Internet to surf the web or send emails. People stream audio, video, play games online, download many applications as well as upload a lot data. Today there are smartphones, tablets, laptops, computers as well as security cameras that are connected to Wi-Fi network simultaneously. 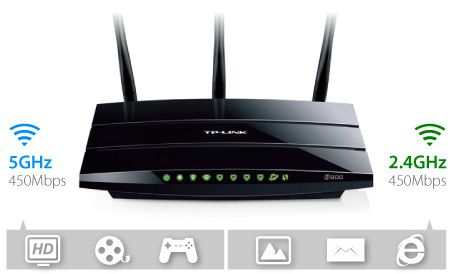 In this case, use of dual band routers will ensure the home network to work on optimum level without the lag and slow connectivity issues due to single band routers.